I wish I knew exactly where this old wood house once stood. 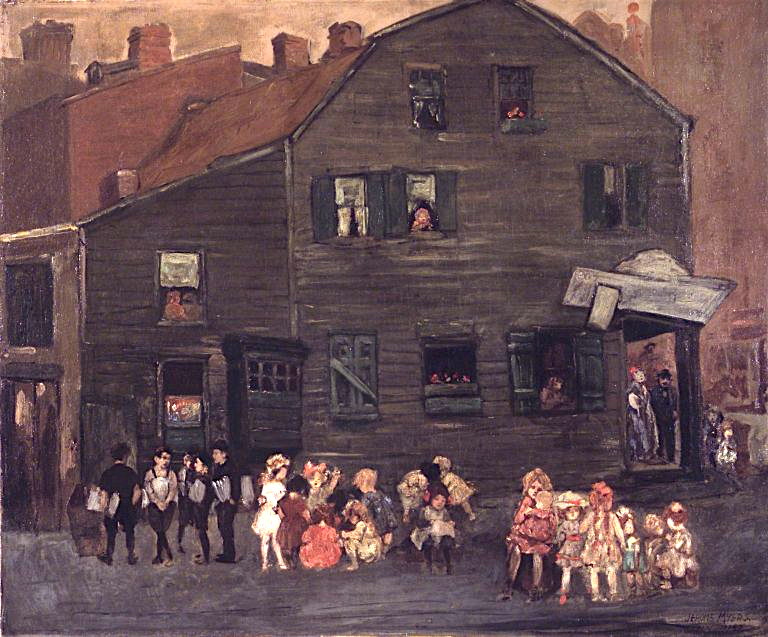 All I know is that it was somewhere in today’s Lower East Side, and in 1915 captured the eye of painter Jerome Myers, a Virginia native who moved to New York in the 1880s. Myers focused his attention on the city’s worst slums, and what he called the “human comedy” that inspired and riveted him. 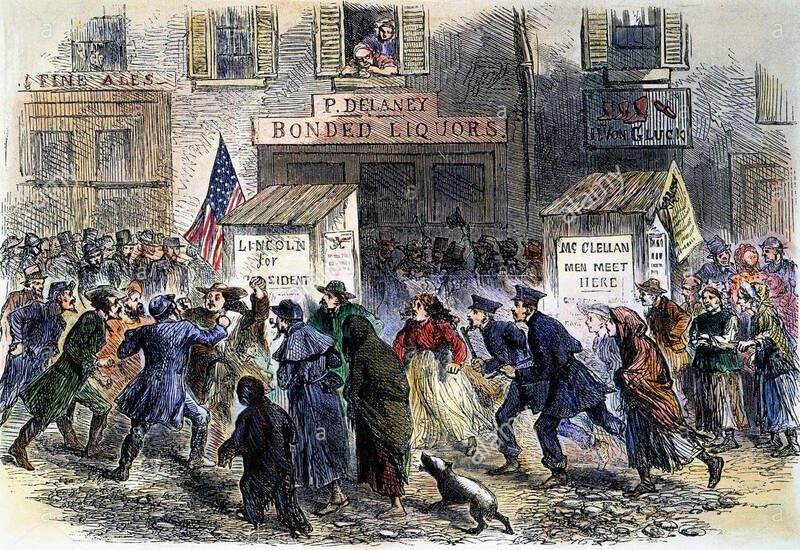 If you think the 2016 presidential election has been brutal, consider the violence triggered by the election of 1864—as seen through the eyes of a bright 9-year-old boy living in a tenement district on Eighth Avenue and 57th Street. 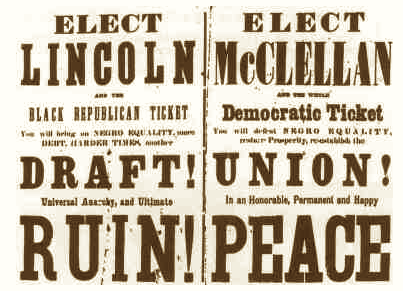 That year, incumbent President Lincoln was up against General George B. McClellan. 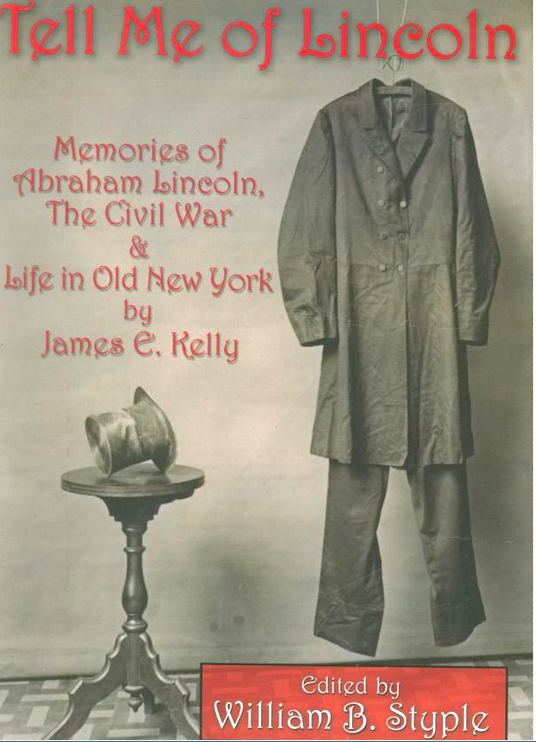 “The campaign was very bitter on both sides in our neighborhood,” recalled James Edward Kelly, a sculptor who published his memories of the Civil War–era city in Tell Me of Lincoln. 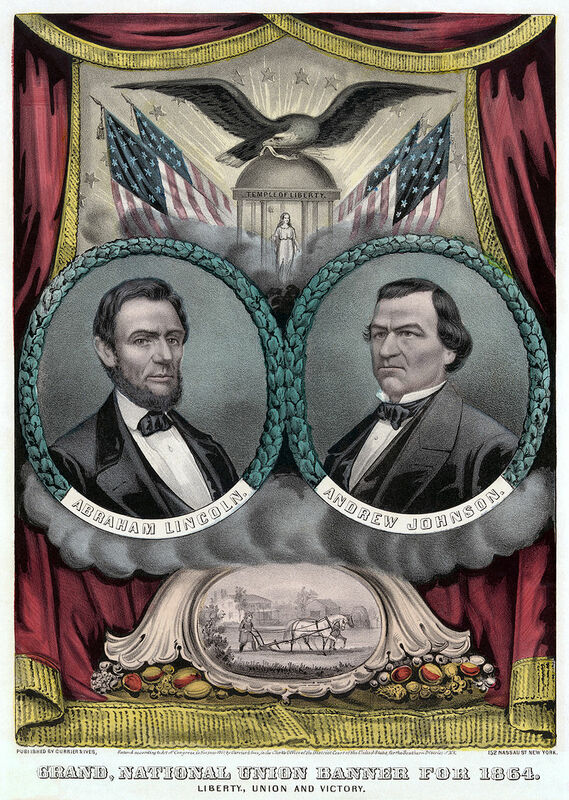 Kelly remembered his pro-Lincoln father, “having rows with the Copperhead neighbors.” Copperheads, of course, were Northerners who were against the Civil War. 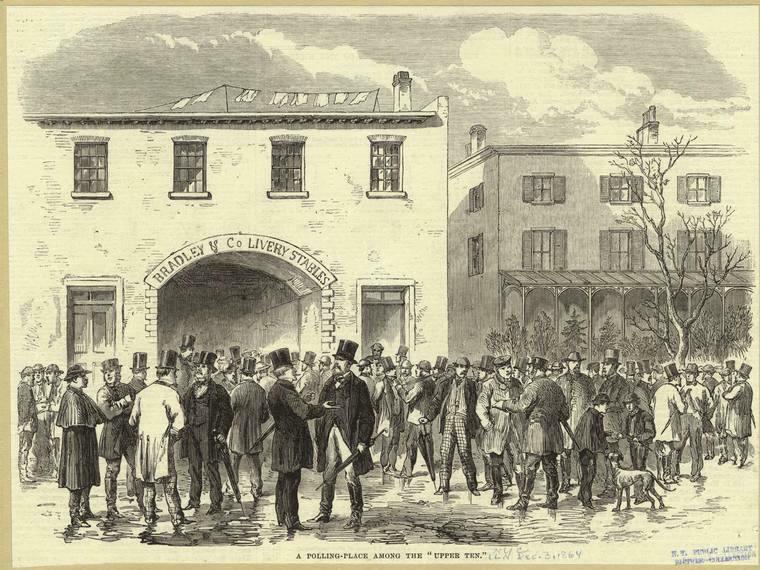 There were plenty of Copperheads in New York, who felt the war was bad business for New York merchants. Thousands of immigrants, many Irish, who had fought in the war were also disenchanted. With a war going on, much was at stake—and it showed in city streets. After a brutal campaign season, it was finally Election Day, a holiday in the city. On that cold, rainy morning, Kelly left his house to a polling place. At day’s end, the action was only beginning, with Election Night bonfires illuminating the sky. The results weren’t in until the next morning. While Lincoln received only 33 percent of the vote in New York City, voters from the rest of the country gave him a second term. Kelly wouldn’t yet know that at the end of November, a group of Confederate sympathizers would attempt to burn down New York. 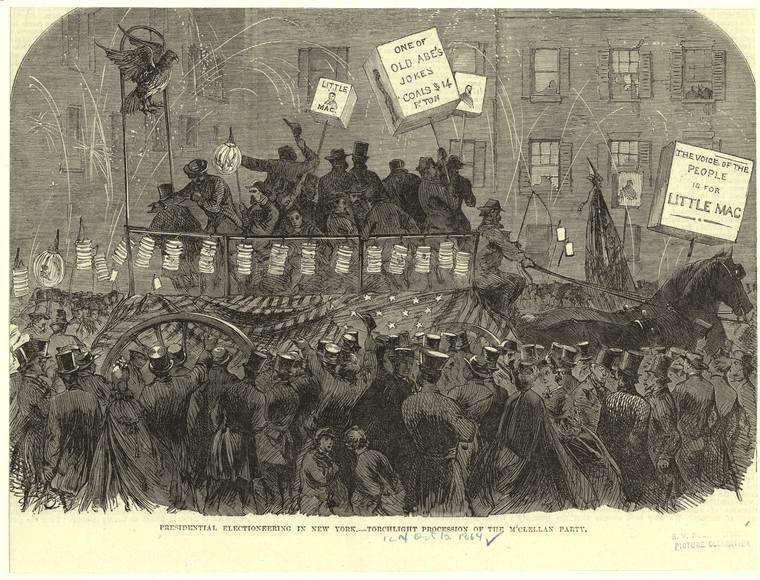 The plot was foiled, and it turned many residents against the South and pro-Union, hoping for victory. Interestingly, McClellan’s son, George B. McClellan Jr., became New York’s mayor from 1904-1909. 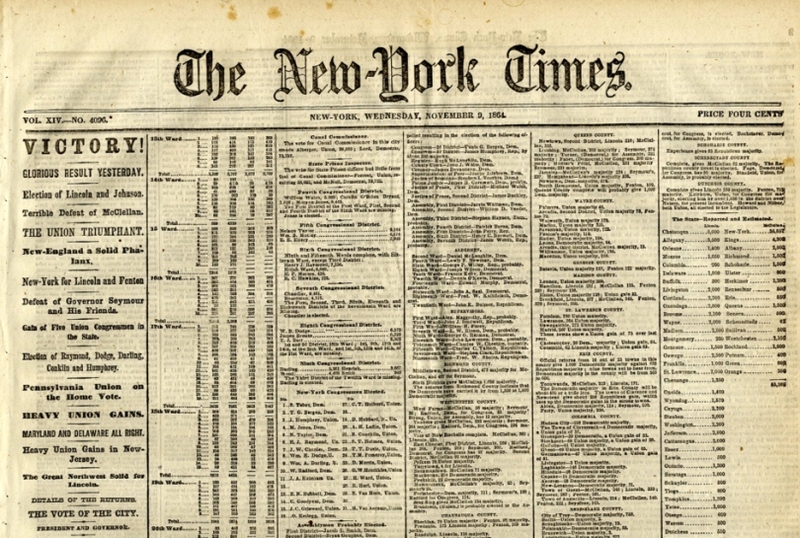 Read about the Plot to Burn Down New York City in The Gilded Age in New York, 1870-1910. 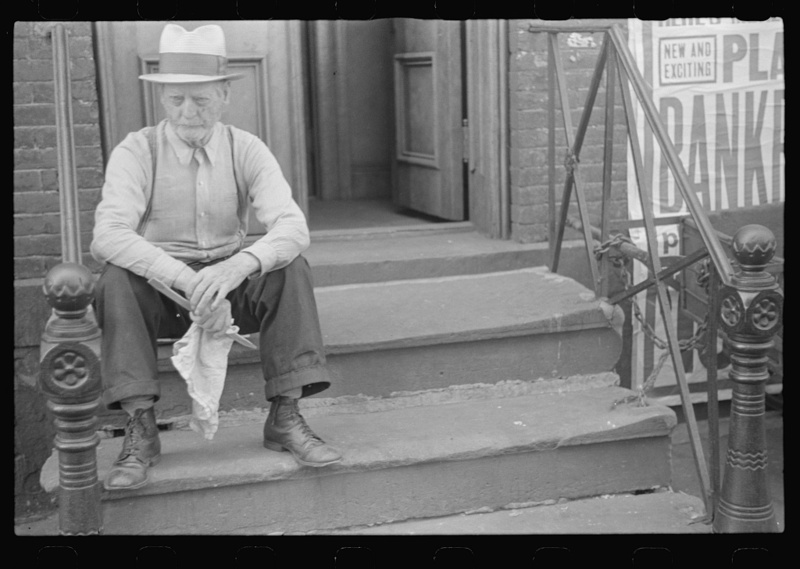 Last week, Yale University launched an interactive digitized photo archive packed with 170,000 incredible photos taken during the Depression. The images, shot by various photographers, are also part of the Library of Congress. They cover faces and places across the nation—including ordinary residents of New York City working, playing, and rushing on their run. 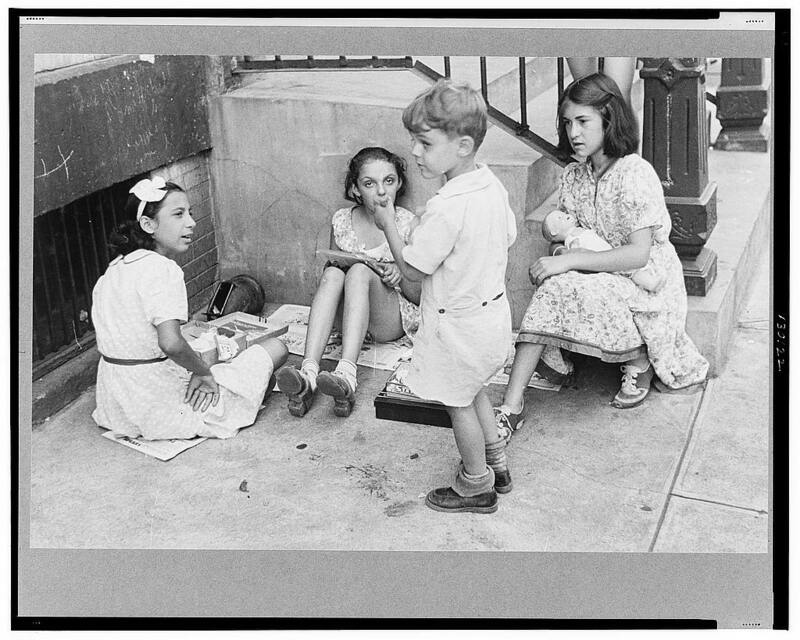 But one subset of photos, shot by Walker Evans in 1938, is particularly haunting. 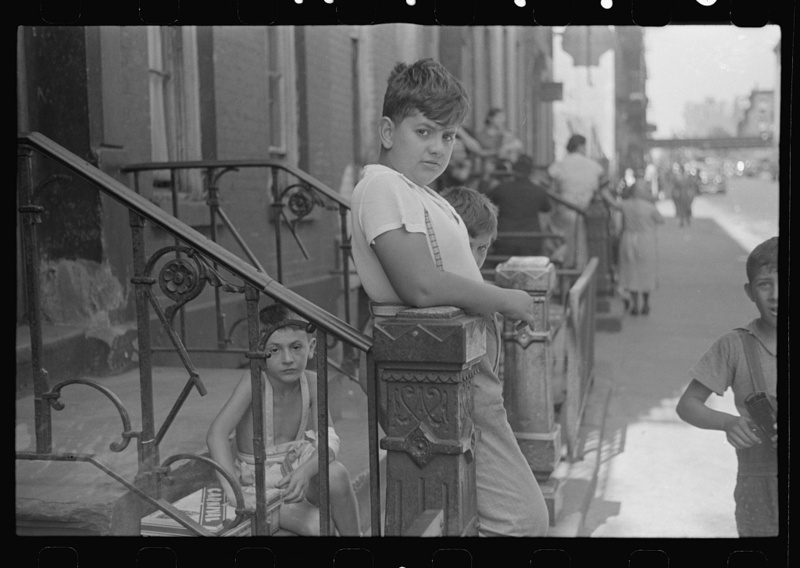 These 40 or so images focus on one gritty tenement block on East 61st Street, and the unglamorous people who live there. This isn’t the East 61st Street of Bloomingdale’s or Fifth Avenue. This is the East 61st Street between Third and First Avenues, a poor neighborhood known at the turn of the century as Battle Row. 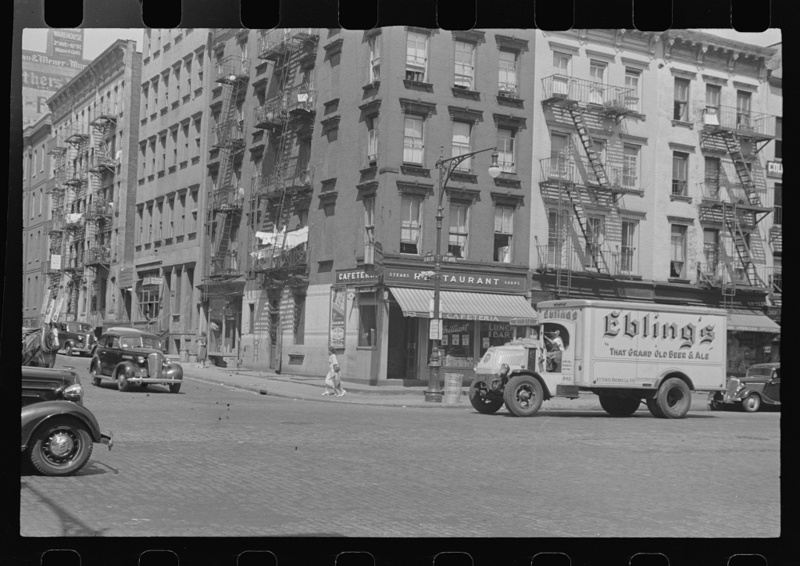 In the middle of the Depression, East 61st Street looks like a regular workaday part of New York City—thanks in part to the corner cafeteria, an idling beer truck, and laundry-laden fire escape (below). The people seem ordinary too. 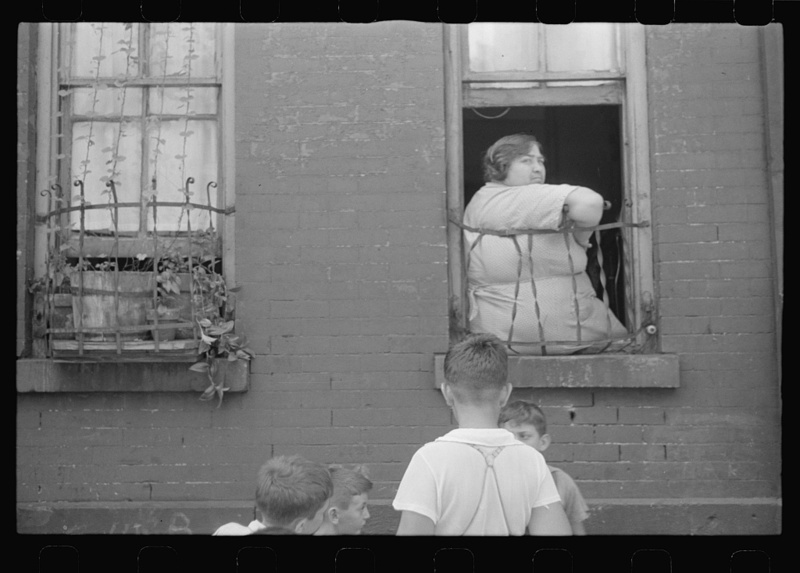 Kids play on the stoop, men and women gather to talk, a lone woman hangs out a window. A solitary older gentleman sits on his stoop forlornly. Who were they? The photos reveal their quiet humanity, and their stony faces hint at hard times. They certainly don’t look like they enjoyed having Evans hang around with his camera. 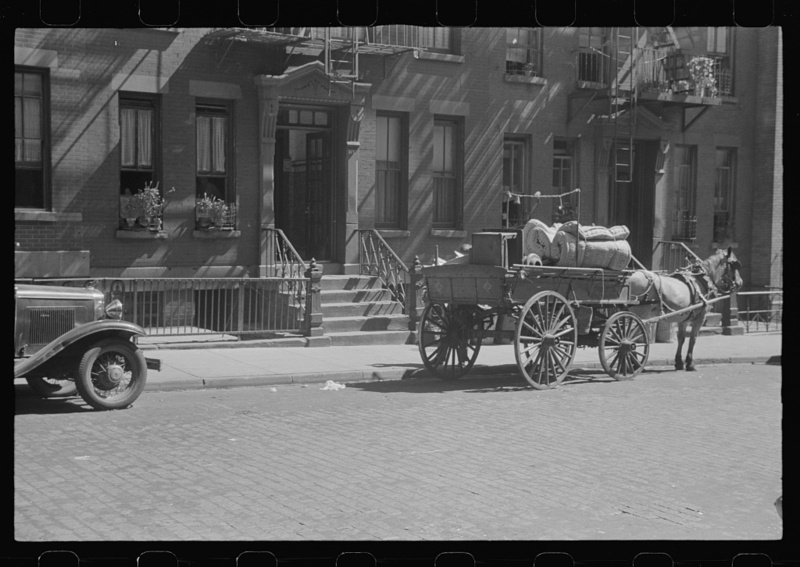 Above, a resident is moving in or out of one building—via a horse-drawn wooden cart. And are those Belgian blocks paving the road? Evans and his camera lurked around other parts of Manhattan in the 1930s as well, like on the subway, where he surreptitiously shot random subway riders staring, reading, or lost in their daydreams. John Sloan sure had a thing for painting rooftops. “Red Kimono on the Roof,” from 1912, is just one of many Sloan paintings depicting the view from a roof, or featuring women hanging laundry or catching a breeze from the top of a tenement. 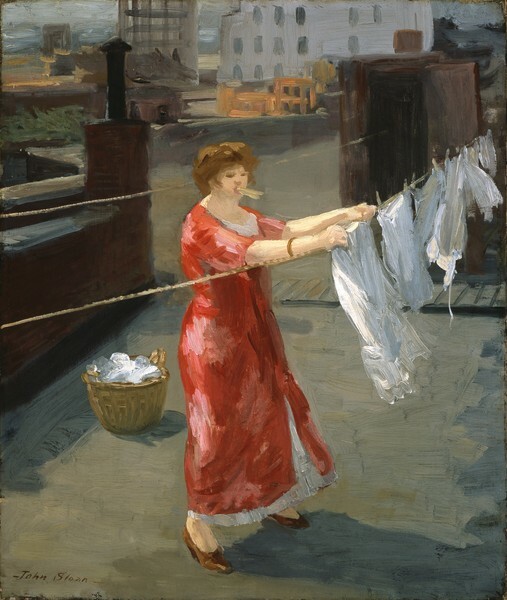 “This unglorified glimpse of a woman hanging laundry was probably painted from Sloan’s studio window,” states the Indianapolis Museum of Art’s website. 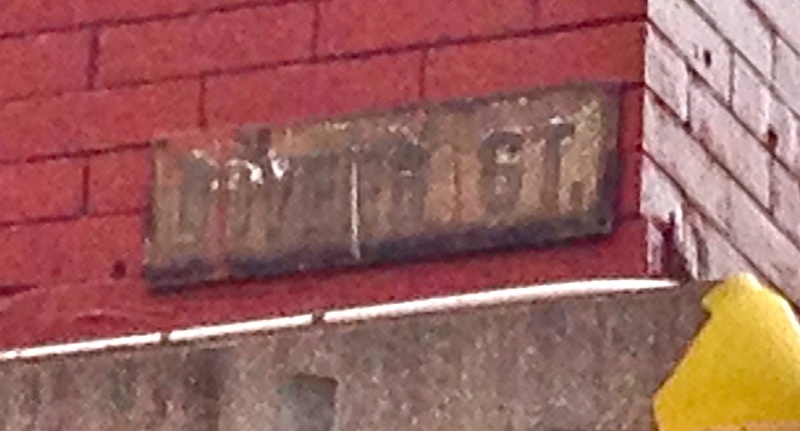 Readers of this site know that street signs are a favorite here, especially the old-fashioned kind carved into a building’s facade—like the one below at Sixth Avenue and 24th Street. Doesn’t the lettering transport you to an entirely different New York? In fancy type it tells us that we’re at The Corner. 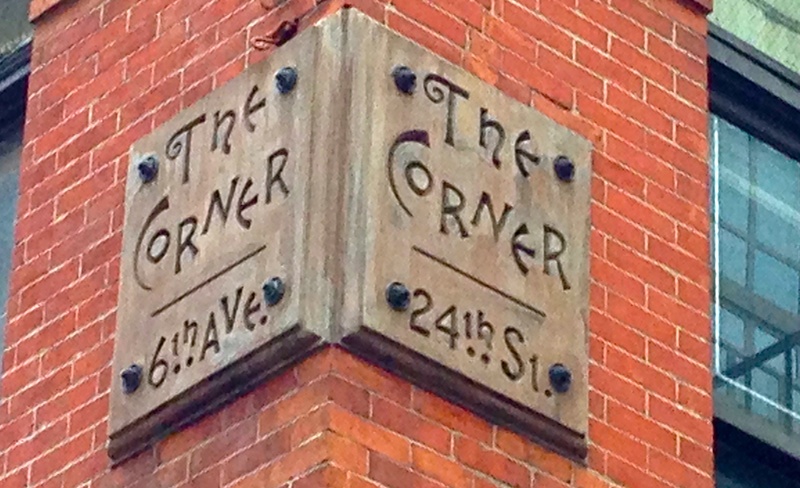 “Built in 1879, it was called ‘The Corner’ and was the beer hall annex to Koster & Bial’s Vaudeville Theater/Concert Hall, where Victor Herbert conducted his 40-piece orchestra,” explains a 1995 New York Times piece. At the time, this was the center of an area called the Tenderloin (also referred to illustriously as Satan’s Circus), the late 19th century sin district filled with dance halls, gambling dens, and brothels. 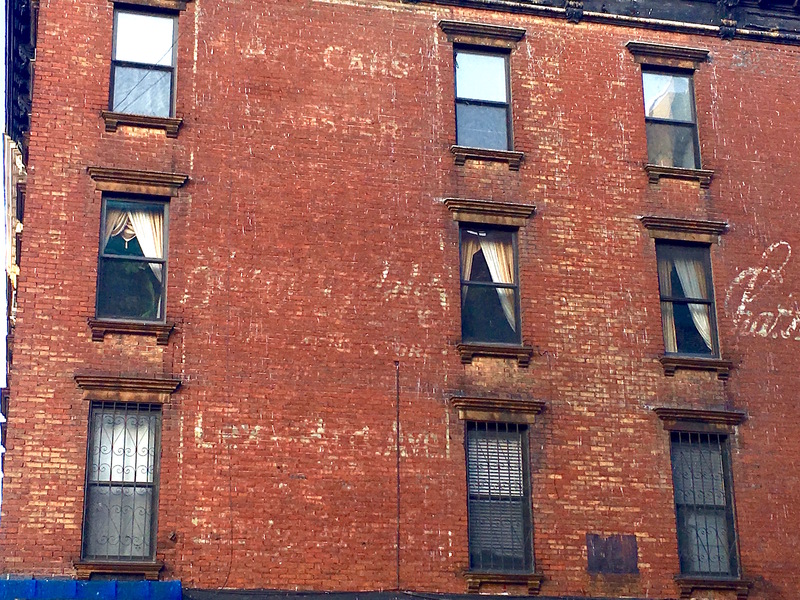 This one on Doyers Street in Chinatown might be the oldest actual Manhattan street sign—meaning a sign affixed to a pole or side of a building, rather than a plaque or engraving. Grimy and hard to read after decades stuck to this building, it harkens back to a more down and dirty Chinatown of tong wars, when Doyers Street went by the infamous nickname the Bloody Angle. 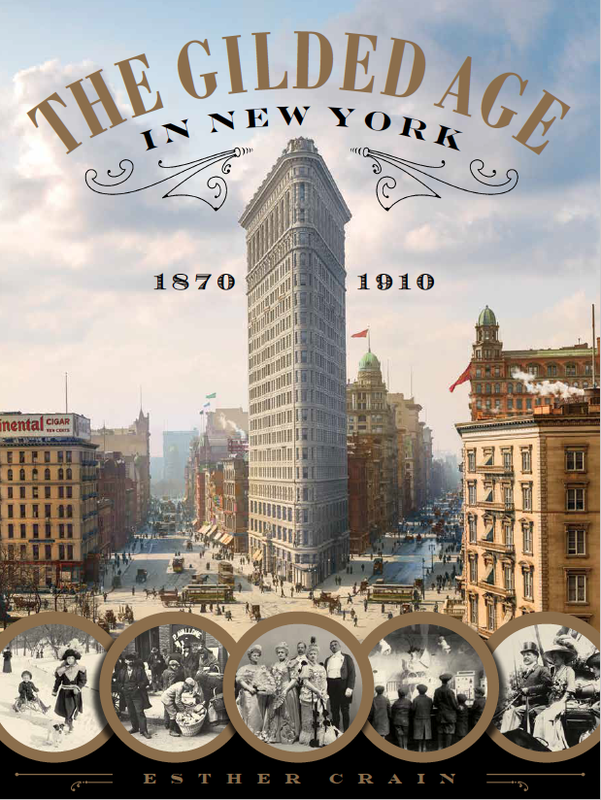 Once, they served as homes, shops, and offices for an older New York. 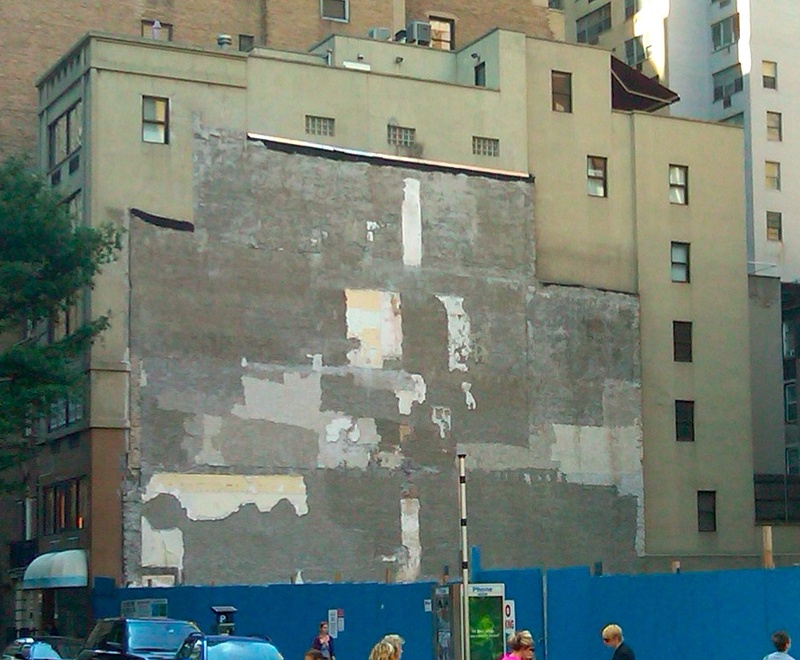 Now, they no longer exist—the only trace left behind are faded impressions where each building once stood. 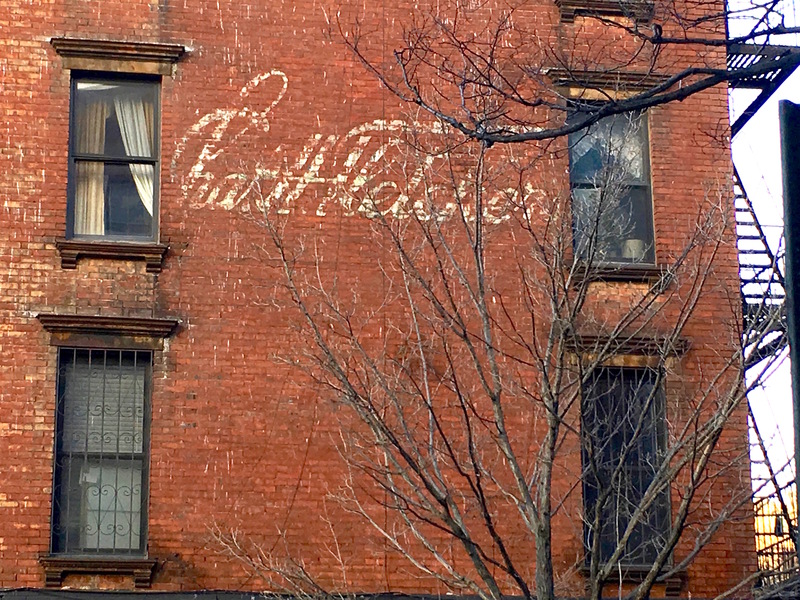 These haunting outlines will also vanish soon, covered up by the new office tower or co-op and erased from the city’s memory forever. I often pass by the long-empty parking lot at Sixth Avenue and 17th Street and wonder about the low-rise tenement that is no longer there. I always liked what looks like a little chimney outline in the center. 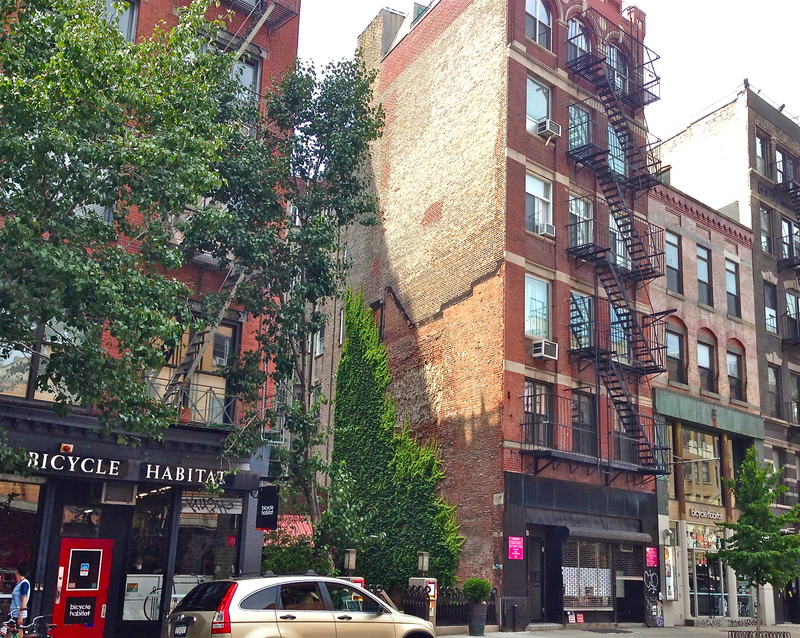 At Lexington Avenue and 56th Street is an odd-shaped building—another tenement? Makes sense; this was once a neighborhood of belching factories on or near the East River and the houses of people who worked in them. Check out the impression of a jagged roof left on a taller building on Lafayette Street. I would have loved to have seen it in person. Chimney outlines are always enchanting. 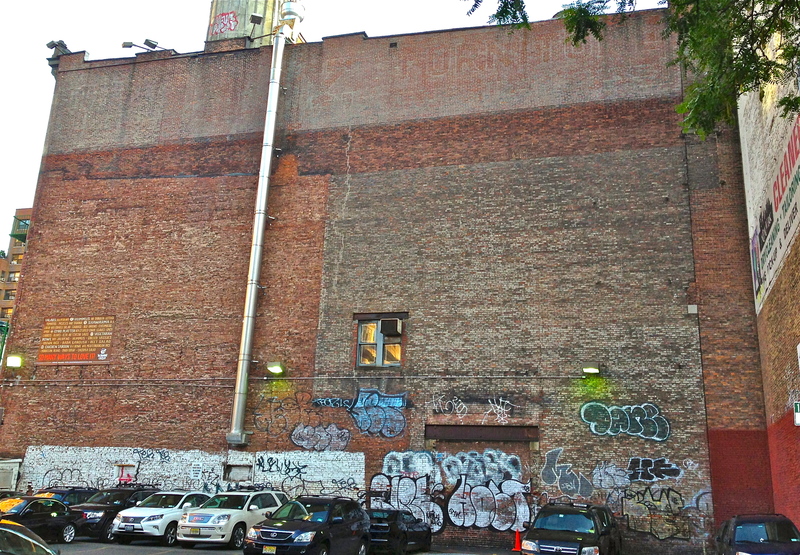 Who occupied this gone-forever little house on West 30th Street, and what were their stories? I love that even the lowliest tenements typically have names. A developer would complete his building, then carve a word or two above the entrance—such as the name of the street or a popular politician—to distinguish it from the pack. Some names are obvious, others more mysterious, such as this one in the East Village. The Claremount is a handsome building on East 12th Street. But why Claremount? Claremont Avenue, named for an old New York family, is a short street in Morningside Heights, but I’m not aware of any connection between the Claremonts and the East Village. Perhaps it just sounded posh. 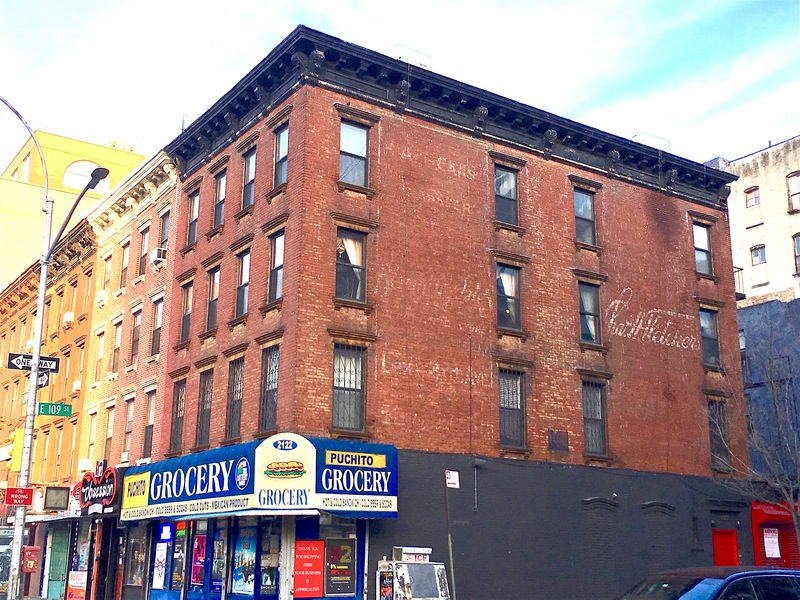 The Nonpareil is a tenement on Edgecombe Avenue on the Harlem/Washington Heights border. It translates into “having no match” or “unrivaled.” Quite a boastful name for such a humble building! Minneola is reportedly a Native American word for “a pleasant place.” Hence this building, in the South Village. Or is it a misspelled homage to Mineola, Long Island? Helen Court sounds like a soft, peaceful tenement. It’s in Harlem near 125th Street. Helen was a popular name about a century ago. Who was Helen—the developer’s wife or daughter? 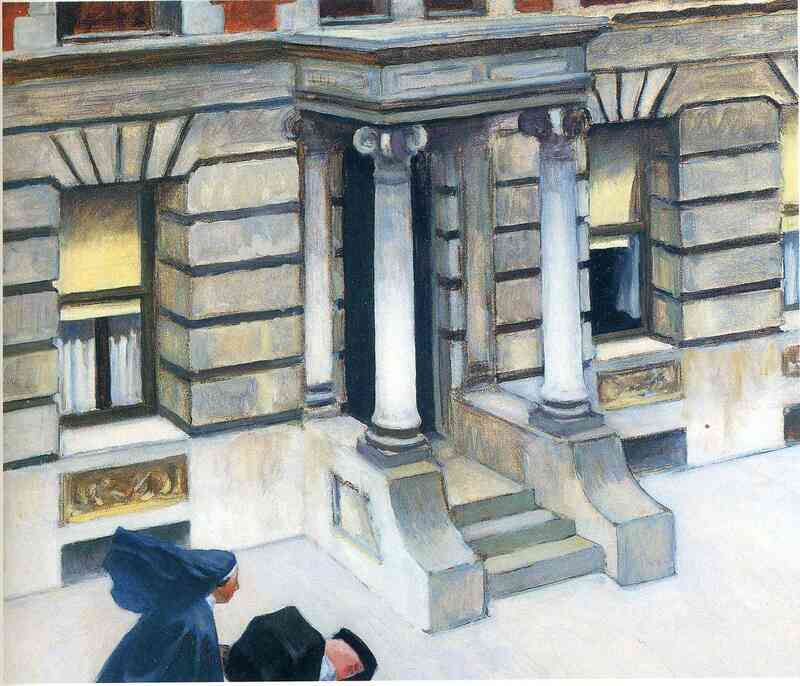 “Edward Hopper’s haunting realist canvas evokes an enigmatic emptiness that has become the artist’s trademark,” states the caption accompanying this 1924 painting on the website of the Chrysler Museum in Norfolk, Virginia. It’s such an ordinary city scene yet so disquieting. Who is the nun with the baby carriage, and what neighborhood is this? 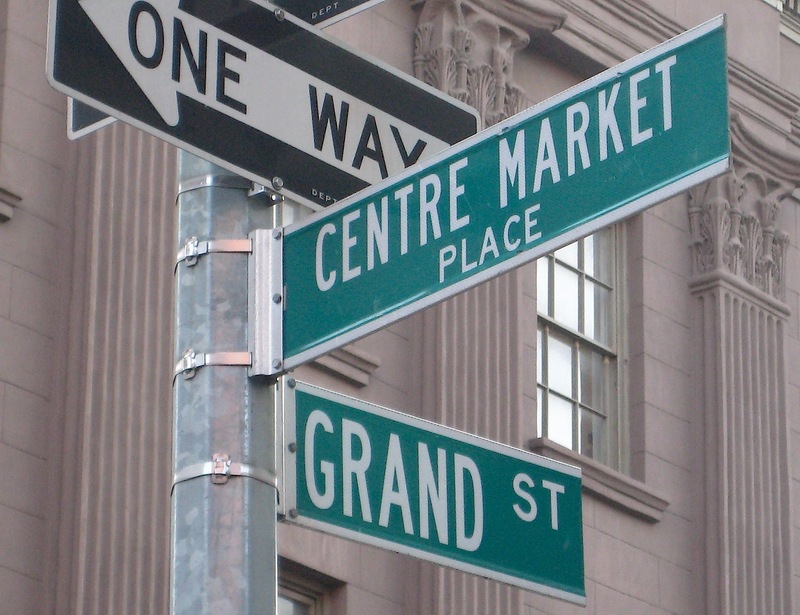 Centre Market Place is a charming New York alley that’s easy to miss. It’s just a one-block sliver of pavement behind the old Police Headquarters (now a luxurious residence) on Centre Street. 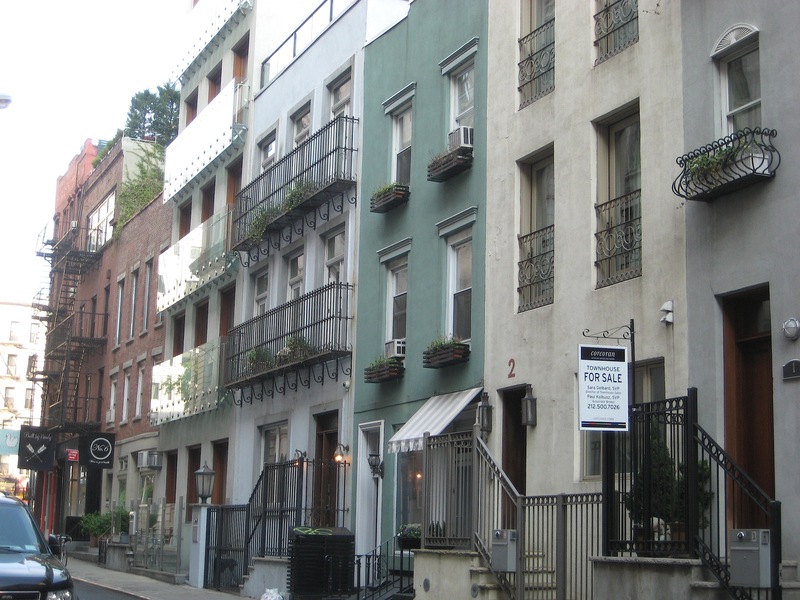 The alley is all very contemporary Nolita, with brightly painted townhouses topping expensive boutiques. 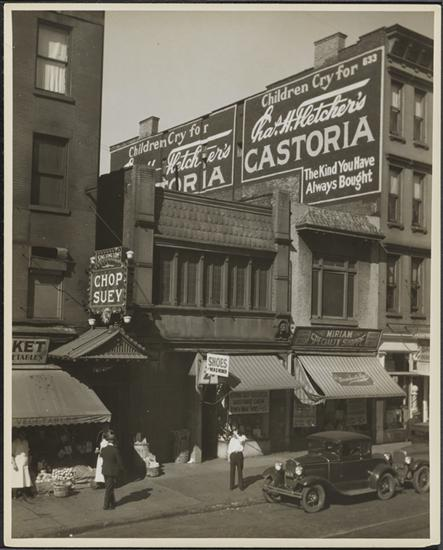 But for the past 150 years or so, it was just another crowded strip in a poor stretch of the East Side. 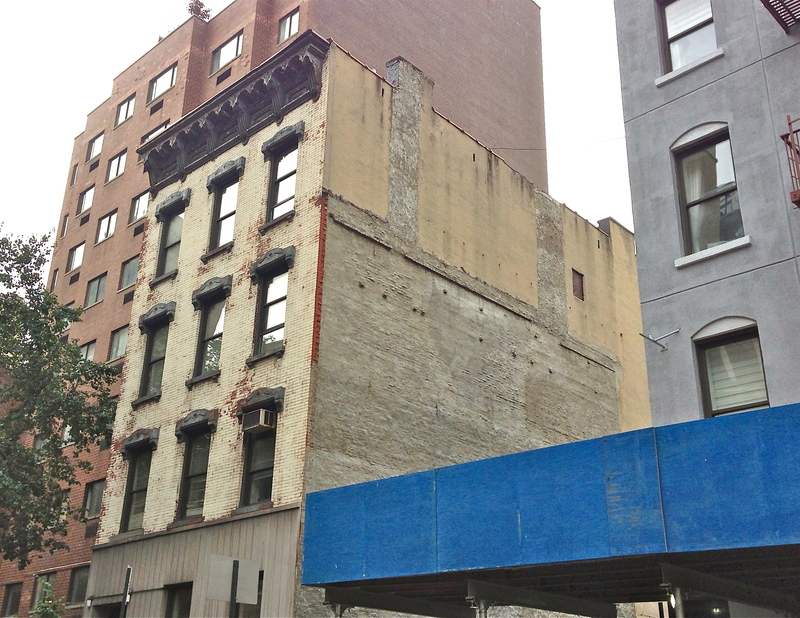 It’s a block now mostly scrubbed clean of its rougher edges, which included a public bath at number nine on the Broome Street end. 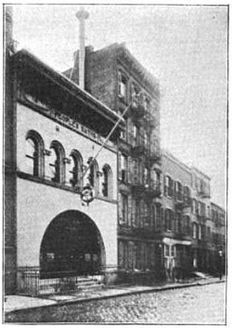 Called the People’s Bath House and built by a private charity in the 1890s, it used to be crowded with mostly Italian immigrant tenement dwellers. The site where it once stood is now an empty lot. Centre Market Place also had an illustrious resident in the 1930s: crime photographer Weegee. His one-room apartment, perfectly located near all the police action, was at number five. A gritty industry thrived on the street as well: guns. Several gun shops were located there through much of the 20th century, fueled by the NYPD. The gun dealers are gone, but the sign (below) still exists at number seven for Sile, a gun distributor with a branch in Brescia, Italy.